Hello again friends – it’s giveaway time again! I’m so glad you all are enjoying Design Improvised’s Birthday Giveaway Week. It has been so much fun to bring you awesome prizes from the brands I love most. 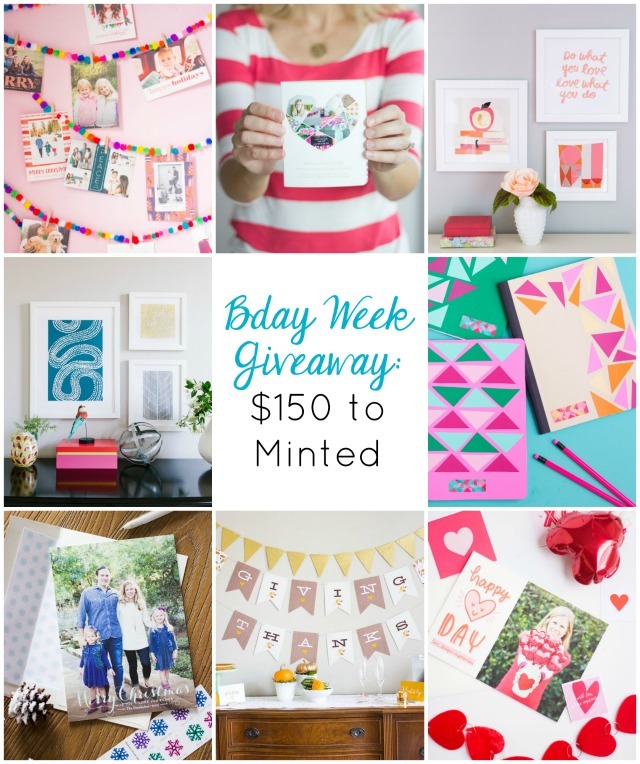 Today’s giveaway is a $150 gift card to Minted! From beautiful stationery, to wall art, to customizable home decor, they have some of the prettiest and most unique products around. 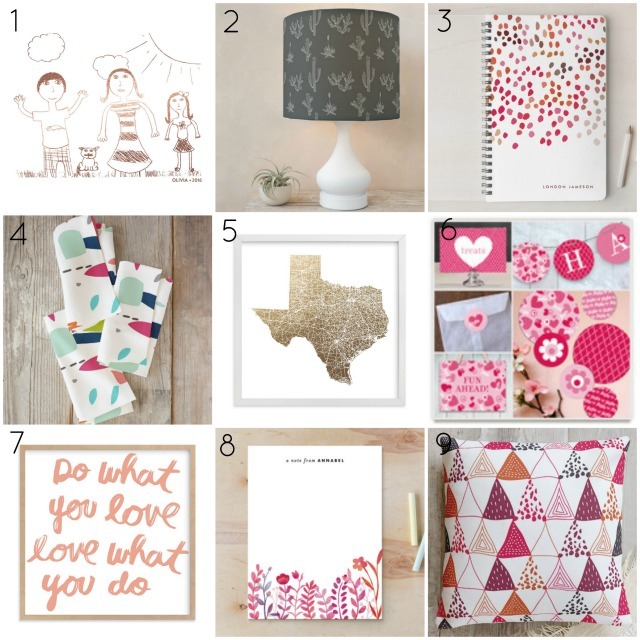 The coolest thing about Minted is that nearly every product is designed by an independent artist. They help support artists all over the world. I’ve had the opportunity to do so many fun projects with Minted, including decorating our master bedroom with wall art, creating Design Improvised’s business cards, styling a special Thanksgiving meal, and sending out Valentines to you all. Read on to see my favorite Minted products and enter the giveaway at the end of the post! 1. Your Drawing as Foil Art Print – Minted offers so many gold foil products. You can even have a piece of your child’s artwork gold foiled! 2. Texas Flora Lampshade – Minted recently started selling home decor products with artist design prints on everything from pillows, to curtains, to lampshades. Every product is customizable – this lampshade comes in 5 different colors, 3 different sizes, and 3 different fabric options. So cool! 3. Cascade Personalized Notebook – these high quality, personalized notebooks make the perfect gift for a birthday or back to school. 4. Splatter Napkins – the Minted artists create some really modern and colorful prints that you can’t find elsewhere, like these splatter paint napkins. 5. Texas Map – want to show your love for your state or city? Minted likely has a piece of art just for you! 6. XOXO Party Decor – one of my favorite Minted projects was a Valentine’s Day party I hosted for my daughters’ friends. Their party decor packages make decorating easy. 7. Do What You Love Print – I have this print in Stella and Hazel’s bedroom. It’s one of my faves! 8. Handpainted Botanicals Stationery – Need a special gift? Minted’s personalized stationery is one of my go-to’s! 9. Oh So Triangular Pillow – one of the hundreds of pillow designs you can find at Minted. A big thank you to Minted for providing the $150 gift card for the giveaway.